All on 4 immediate dental implants. Often when people lose teeth they believe the only options they have to replace them are bridges or dentures. However, Norlane Dental Surgery’s dentists are able to provide a fixed alternative: implants. An implant replaces not only the visible part of the tooth (with a crown made to fit the implant) but also the root, meaning that there is no loss of function with the teeth. Receiving a single implant can improve the way a person’s teeth sit and are supported, chewing food, and even speech. There is no chance of decay with implants either since they’re not real teeth. 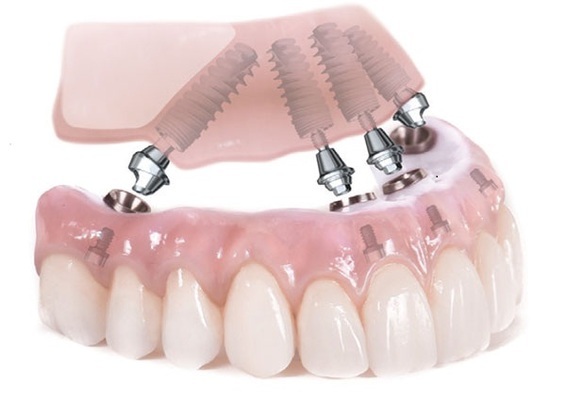 Replacing all teeth on the upper and/or lower jaw is possible through ‘All on 4’, a process involving four or more implants placed in the jaw, and a complete bridge made to attach to the implants. Senior dentist at Norlane Dental Dr Rashi Gupta has completed her Master Clinician Program in Implant Dentistry in Los Angeles and the All on 4 course by Nobel BioCare. “All on 4 eliminates the need for an implant to replace every single tooth. Loose and ill-fitting full or partial dentures are no longer a concern with implants,” Dr Gupta says. For more information regarding implants, or general dental enquiries, contact Norlane Dental on 5278 2666 or visit norlanedental.com.au.